There is [a] 3-D Imax-scale view … Toward the south is the open Pacific, stretching 2,000 miles, straight to Antarctica. The choppy waters of Cook Strait lie to the west, with the jagged mountains of New Zealand’s South Island rising in snowcapped splendor in the distance. Pandora, James Cameron’s mythical “Avatar” planet, overflows with odd wildlife, and so does Pounui. Consider the eels. After living in a freshwater lake here, they slither to the sea and spawn near the faraway island of Tonga. In a life cycle rooted in Miocene times, their elvers — leaf-shaped offspring — ride the currents back to Lake Pounui. Cameron himself isn’t actually calling this a real-life Pandora, although he does plan to shoot the next two Avatars here: They’ll “almost certainly be shot in [Peter] Jackson’s Wellington production studio, about 15 minutes by helicopter from Pounui. Visual effects will be completed at nearby Weta Digital, owned by Mr. Jackson and his partners, though motion-capture work on the ‘Avatar’ sequels will still be done on a stage in California. 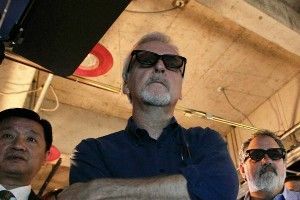 ‘Avatar 2’ will not be ready until 2015 or later, at least a year past the 2014 date Fox executives once had in mind.” (Also, while a third sequel has been rumored, Cameron hasn’t made up his mind on that yet.) And while James is still in Santa Barbara right now, finishing up the Avatar scripts, in the fall he’ll head to New Zealand (where he says he and his family will live at least half the year) to get full-on IRL Pandora-y. Because that’s how James Cameron lives, you know? All epic, all the goddamn time.